Review posted November 16, 2018. A Neal Porter Book, Roaring Brook Press, 2017. 32 pages. I’m biased in favor of this book. At the 2017 ALA Midwinter Meeting in Atlanta, I heard Erin Stead talk about how they found the manuscript and I saw some images from the art. Erin and her husband first saw the text as a poem in a newspaper put out by homeless folks. When they tried to find the author, they learned he had just died in his 90s. Their publisher worked hard to get permissions, and the result is this beautiful and quiet picture book. I certainly would not have seen this poem as a potential picture book text. But seeing it in that form, I have to acknowledge that these words are the perfect vehicle for Erin’s art. 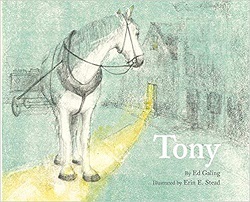 The story (almost the incident) is of a cart horse named Tony who pulled a milk truck. Early in the morning, Tony and his driver would bring milk, butter, and eggs to the author’s house. He was awake, even though it was 3 a.m., and would greet Tony. See how simple? But oh, the beautiful art! The simple curve of one of Tony’s legs, showing the little dance. The color is a simple green background, with radiant highlights of yellow for the rising sun or light coming out of a building. And Tony – well, I fully believe that he is such a wonderful horse. This isn’t a snappy or silly story. This isn’t a fable or a myth. It’s more of a vignette, but a slice of life that reveals love and friendship. It’s the sort of book that compels an appreciative pause when you’re done. This is another one where my descriptions don’t do the artwork justice. Check it out yourself!